International trade fair Cevisama, the Spanish Association of Ceramic Floor and Wall Tile Manufacturers (Ascer) and the Instituto de Tecnología Cerámica (ITC) have launched a fresh round of the Trans-hitos competition. The associated exhibition is part of the Cevisama showcase and every year aims to reveal the most innovative uses for ceramic as a material and the potential it offers. 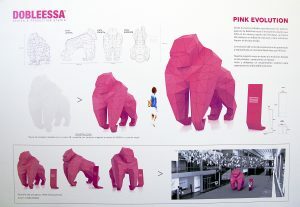 The competition seeks to support the work of young creatives and the winner of the first prize sees their design take on physical form within the Trans-hitos space, exhibited in Feria Valencia’s central mall for the duration of the fair. The winning design poised to be exhibited at the upcoming edition of Cevisama, which takes place from 28th January to 1st February, is “House of Cards”, by architecture and interior design studio Nihil Estudio. According to the designers, the project “attempts to build a house of cards out of large format engineered stone tiles” and will be one of the items set to be seen by some 100,000 professionals who are expected to attend Cevisama 2019 and are very likely to visit the Trans-hitos exhibit. The jury was chaired by the president of the Regional College of Architects of Castellón, Ángel Pitarch, whilst members included Víctor Echarri, head of the Ceramic Studies Department at Alicante University; architect Guillermo Vázquez; Javier Mira, Ana Martínez and Carmen Álvarez, representing the ITC, Ascer and Cevisama respectively. The jury also decided to single out two other designs entered for the 2019 Trans-hitos competition, awarding each a runner-up prize. These were “The hidden face of ceramic”, by Esculpir el Aire Estudio, “for the way it has built a dynamic, elegant space out of a minimum number of elements”, and “Pink Evolution” by Dobleessa Design & Production Studio, “for how the shape and colour of the powerful icon break new ground, creating something that is a world away from any conventional design”.